2017, the year of the 11th International Kimberlite Conference, is the 50th anniversary of the discovery of the first economic kimberlite in Botswana, now the Orapa Mine. 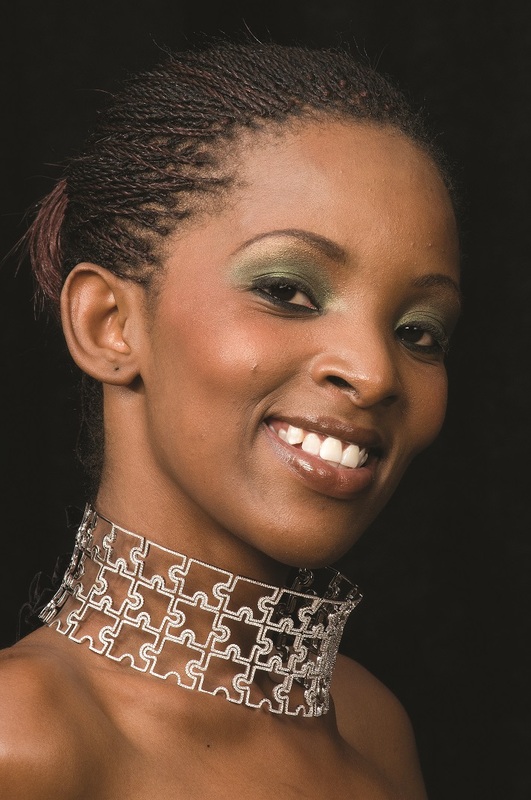 To highlight the transformation of Botswana into the largest diamond producer by value worldwide and Gaborone becoming the world’s premier diamond centre, the anniversary will be celebrated at 11 IKC under the banner of “50 Years of Diamonds in Botswana”. Events and some of the relevant history are presented below. 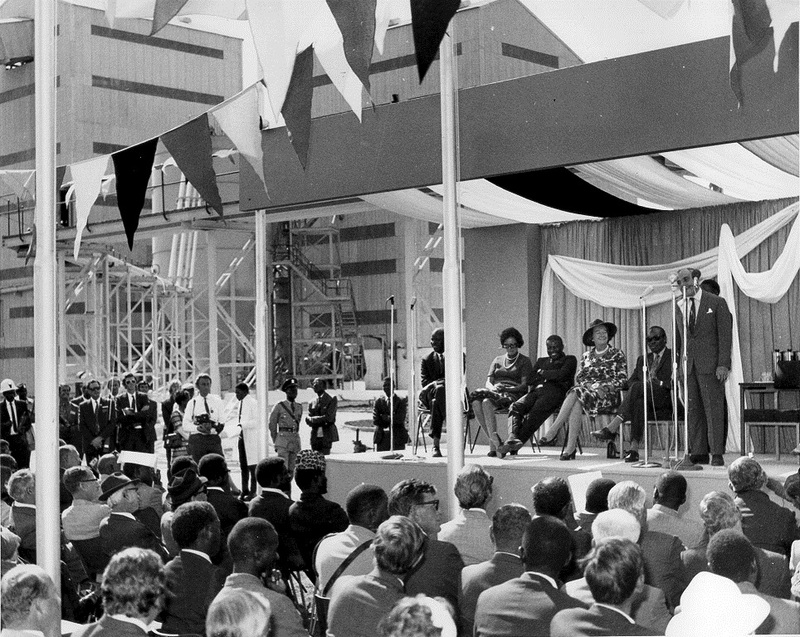 De Beers will be celebrating the 50th anniversary of the discovery of Orapa. Delegates will receive a set of handouts of the Maggie Newman paintings depicting the diamond story courtesy of De Beers Group of Companies. The details of the kimberlite crater below are based on our understanding of Orapa. De Beers will continue the long tradition of sponsoring the Farewell Dinner which will be celebrated at 11 IKC as the 50th "birthday" of Orapa. A documentary video will be shown which chronicles the beginning of 50 Years of Diamonds in Botswana: the discovery and evaluation of the Orapa kimberlite as well as the construction and opening of the Orapa Diamond Mine. 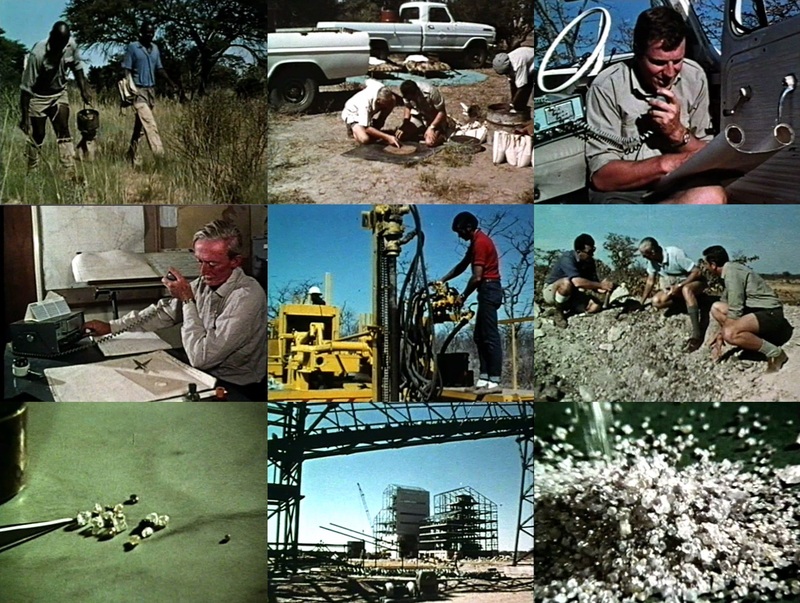 This 25 minute documentary is a ~1971 De Beers Botswana Mining Company Production. 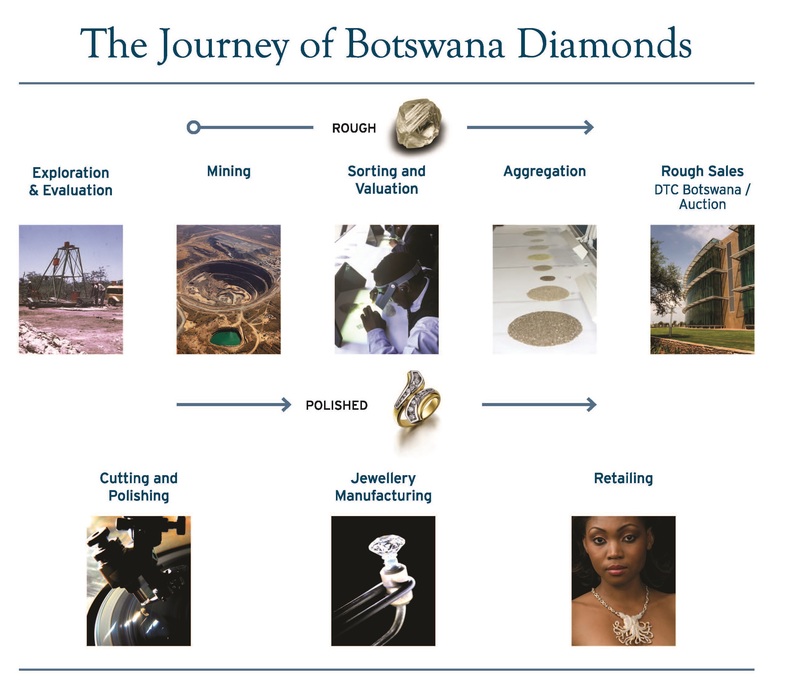 This presentation is courtesy of Debswana Diamond Company and The De Beers Group of Companies. 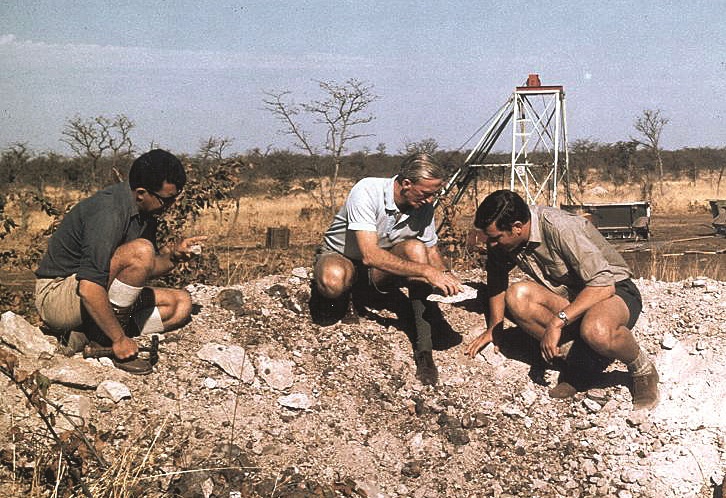 From left to right: De Beers prospecting team collecting reconnaissance surface loam samples; De Beers exploration geologists Dr Gavin Lamont, known as “Doc”, and Jim Gibson examining an initial positive sample; field geologist Manfred Marx in 1967 radioing in the very positive results from follow up samples collected in the area of the Orapa cattle post; Doc receiving the good news; drilling to confirm and delineate the 2125 A/K1 kimberlite; one of the initial evaluation sampling pits being examined by Jim Gibson, Gavin Lamont and Manfred Marx; early evaluation diamonds; mine construction; early production diamonds from Botswana’s first diamond mine. 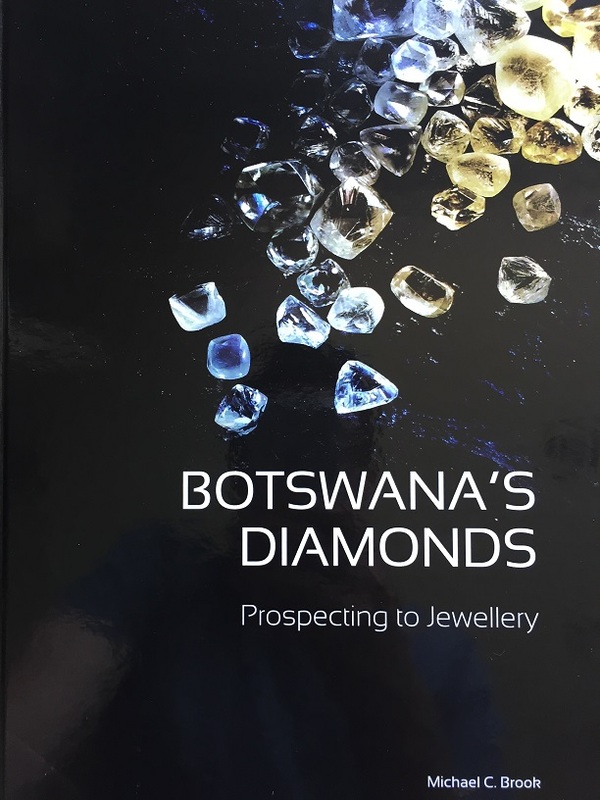 Books will be available for sale at the conference that capture the history of 50 years of Diamonds in Botswana from the early prospecting days before the discovery of kimberlites to Botswana being the world’s largest diamond producer by value. Many of the photographs used on this website were provided by Mike Brook of Debswana from Brook (2012). Published in 2012 (ISBN: 978-99912-941-8-6). 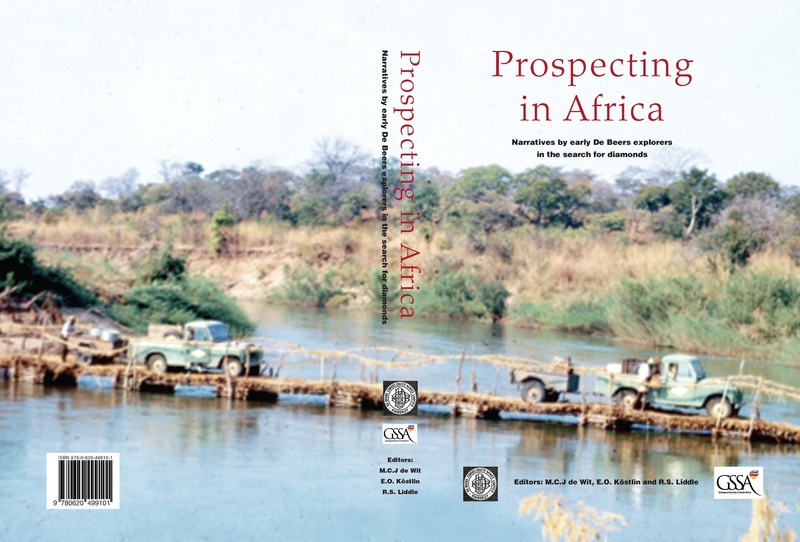 Published in 2011 by De Beers Consolidated Mines Ltd.
Sold by the Geological Society of South Africa. 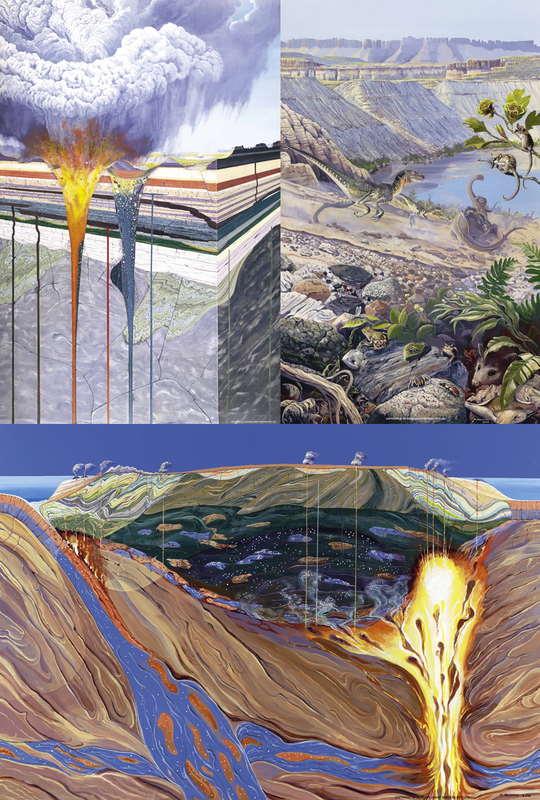 Proceeds are donated to a post-graduate student fund at the Geology Department of the University of Pretoria. The first recognised diamond find in Botswana was in 1955 by Consolidated African Selection Trust in alluvial deposits along the banks of the Motloutse River at Foley siding, some 250km east of the now Orapa Town. The first kimberlites were found twelve years later in 1967 by De Beers Consolidated Mines in the Orapa-Lethlakane area. De Beers had been prospecting in Botswana since 1954 under the leadership of Dr Gavin Lamont or “Doc” as he was respectfully known. Doc applied Alex du Toit’s crustal warping theory to suggest that the Foley diamonds came from the Kalahari Desert and, with Jim Gibson in 1966, found abundant ilmenites and garnets (indicator minerals). This led to a period of incredibly successful prospecting (1967-1982) during which numerous kimberlites were discovered including all of today’s major diamond mines in Botswana. The first economic kimberlite Orapa A/K1 was found by Manfred Marx and his team on 25th April 1967. Manfred Marx at Orapa A/K1 kimberlite evaluation pit (1967, De Beers; p. 64, Brook 2012). De Beers Botswana Mining Company was formed in 1969 and in 1975 became a 50:50 joint venture between De Beers and the Government of Botswana. In 1992 the joint venture was renamed Debswana. The following years, 1971-1982, were a decade of opening mines: Orapa in 1971, Lethlakane in 1977 and Jwaneng in 1982. Exploration also continued. 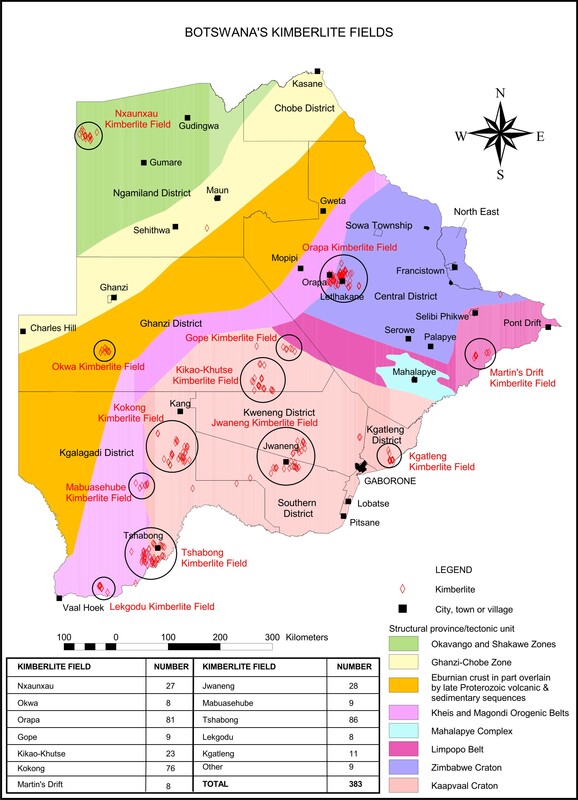 In 1978-1982 Falconbridge found more kimberlites including Tsabong, Kokong and Gope. Many of these prospects have been revisited and since 2003 there has been a second phase of smaller mines opening: Damtshaa Mine by Debswana (2003; Orapa B/K1, B/K9, B/K12, B/K15, currently on care and maintenance), Lerala by DiamonEx (2008 but currently closed; also known as Martin’s Drift), Orapa B/K11 by Firestone (2011 but currently closed), Karowe Mine by Lucara Diamond Corporation (2012; Orapa A/K6) and the Ghaghoo Mine by Gem Diamonds (2014 Gope 25). Further exploration and evaluation in Botswana is ongoing. The first kimberlites were found almost immediately after the independence of Botswana in 1966 (formerly the Bechuanaland Protectorate under British Rule). Botswana is now the largest diamond producer by value worldwide. 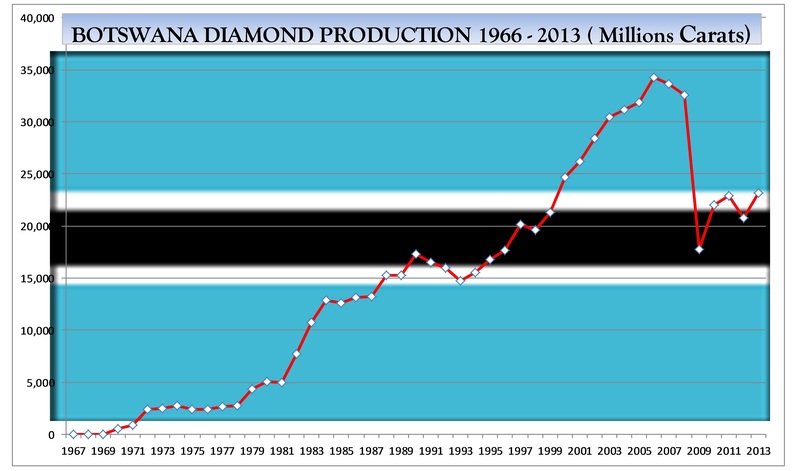 Diamond mining has transformed the country. Botswana was once one of the five poorest African countries, but today it is ranked the highest on the African continent in terms of per capita GDP. Successive stable democratic governments since independence have created a safe environment, vibrant and growing economy. Gaborone, the capital, is a modern city and is becoming the world’s premier diamond centre. 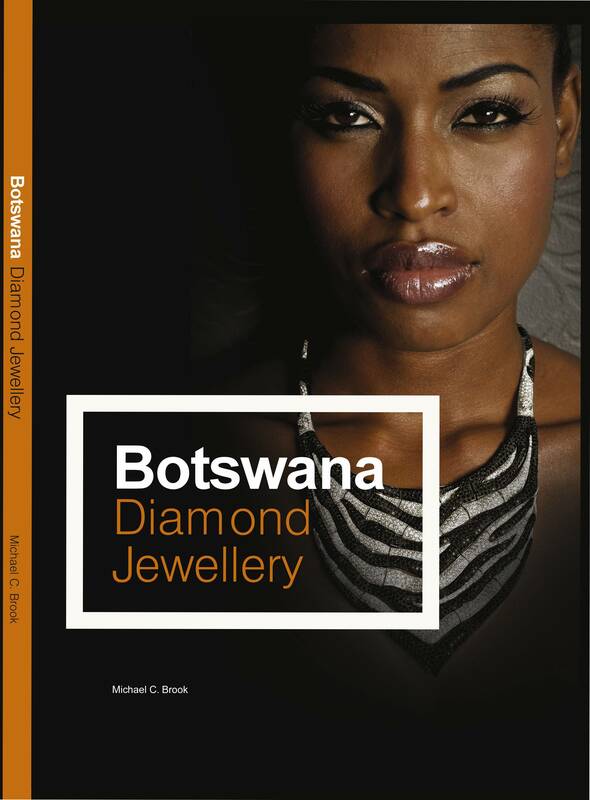 It is now the home of the Diamond Trading Company Botswana (DTCB; a 50:50 joint venture of De Beers and the Government of Botswana). The relocation of the De Beers global sightholder sales from London in 2015 to Gaborone and the development of a diamond cutting industry represent the successful downstream beneficiation of diamonds in Botswana. Dalumi Group, Motiganz Diamond Group and Yerushalmi. (17.169cts) (p. 246, Brook 2012).